Anyway, let's go on to the main subjest!! Can you belive that they are NOT real soba in the picture:)??? Actually, they are not real, but they are playfoods!! It means that they are fakes of food!! In Japan, such playfoods are displayed in front of restaurants, and they are very elaborate and they look like the real things:P One of my foreign friends were surprised by the amount of various playfoods including soba, parfait, hamburger steak, spaghetti, omelets, sushi, and many many things. I don't know that there are playfoods are popular in other countries, but Japanese playfoods are so on a high level:)!! There are key rings which have playfood, (of sushi or tempra, somthing like that) so you can get them, and your friends must be pleased if they get them as souvenirs!! Most Japanese people eat soba on New Year's Eve, how about you? You changed your blog's style, huh? Thank you, Yurie:D Of course, I eat soba on December 31st:) But I rather like udon than soba!!! The fake food that's used for shop displays here in England are nowhere near as realistic as that!!! When you come to tokyo, you should go to Kappabashi, which is near Asakusa. It is the district that sells restaurant supplies, including the largest selection of display food. There are entire stores dedicated to this product. I go there all the time, especially when you do not update your blog. By the way, I like soba a lot. It is especially good if have it after a long hike in the mountains. But I think most food is good after that. yes I've seen these playfoods in many Asian restaurants...:) Looks delicious! Really?? I wanna see them:) What kind of displays are there?? Sushi and soba too? Oh!! Thanks for your good information:D I wanna go there, and buy them:D But I think that such food displays are a little expenssive, aren't they? Have you been to Japan? Japan's food displays are spectacular!!! Here in England, fake food (mostly fruit and vegetables)is usually only seen in very small shops and is made of very unrealistic plastic! hey dats cool...i really thot it wuz real food! You are a wise girl even though u are just 19.I know u will get married too when ur time comes.You have a chance now to get blessings by fixing my marriage. As you know I am already 30 and single and looking for someone. I want your opinion about this profile which I am posting on a matrimonial site. Opinions from the bloggers like you matter the most to me. So I will be more than glad if u can evaluate my profile. P.S:-Is it too much to ask for a little help from a virtual friend? Haruna above comment isnt from me...someone cloned me and leaving comments like me...just check the blog id to verify. Rea dmy latest post's comment section...I have details. Thanks! Who are you?? Why did you clone her? You said "honesty is my best policy." Is it a lie? Interesting! Seeing 'Playfood'really surprised me when I first came to Japan. It must be difficult to make! As for slurping food, I don't think I'll be able to eat politely when I do back to America. Slurping is too much fun, and it helps cool off hot food. I'm going home next week - my family will think I'm so rude! By the way, Toriyoshi, the yakitori place I mentioned a while back, is a small izakaya in my town. It is unique - very rustic. 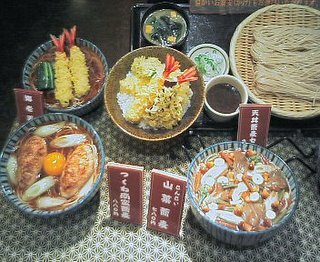 They serve great food - ramen salad, sweet eggplant with miso, chicken sashimi and nanko, a soup made with horse intestine. If you are ever in Sorachi, I'll take you to Toriyoshi for a visit. Sounds great!!!! I've never eaten horse intestine and chicken sashimi. I wonder how they are....I've never been to Sorachi, but I wanna go!!!! Is Toriyoshi a chain store? Is there Toriyoshi in Sapporo too??? I really wanna go! Do you know a good OKONOMIYAKI reataurant? I really like Okonomiyaki!!! We r in athe process of creating the directory of DESI bloggers all over the world. No problem:D Be careful for such stupid people!! !